Our Lady of Mount Carmel School is often regarded as a family-like community. Our faculty and staff strive to teach mutual respect to our students, and we maintain a strong focus on service to those in need. Faith Day, held every year at our school, is a culminating day of prayer, service, community and study that impacts all our faculty and staff in an extraordinary way. The students broke into small groups called “faith families” which consisted of students from all the different grade levels and one or two faculty/staff members. They spent the day with their family, participating in activities, prayer, and service projects together. As we practice virtue, our hearts can expand both to love to a greater capacity and to receive the love of God to a greater capacity. Debates broke out between students as they tried to figure out the answer to the question. Finally, the adult leaders explained that all the cups were equally full, but some contained more water than the others. This was an image of magnanimity. As we practice virtue, our hearts can expand both to love to a greater capacity and to receive the love of God to a greater capacity. Each faith family then drew pictures and wrote examples of deeds we can do to have a magnanimous heart on large pieces of paper cut in the shape of a heart. All the hearts were hung throughout the school as a reminder for us to become magnanimous. 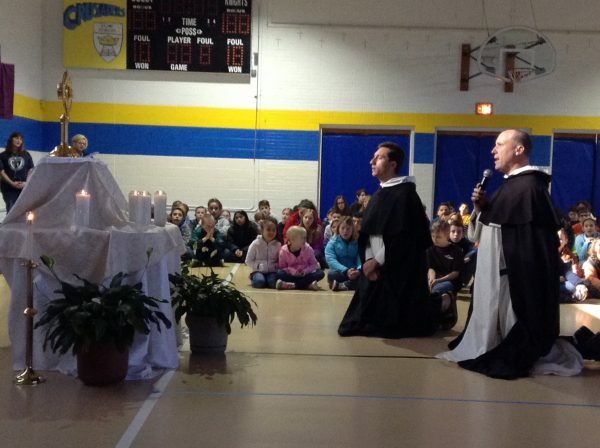 Two Dominican Friars visited the school from Washington, D.C. and spent the day with our students. They heard confessions (with the help of our pastor, Fr. John David) and visited with the students throughout the day. 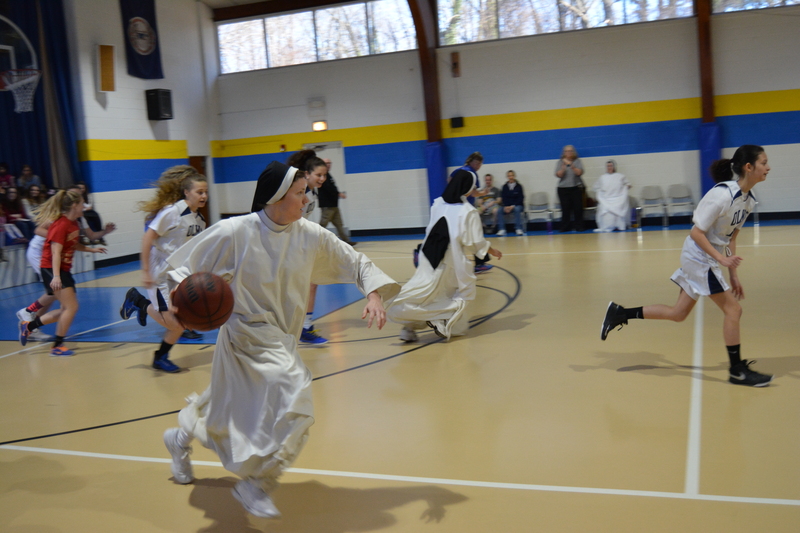 The friars were asked which one was better at basketball, so, to the delight of our students, and in true Dominican fashion, they pursued the truth and had a shoot-out to figure out who was best! As the Eucharist is the source and summit of our faith, so it was the source and summit of our Faith Day. The day started with the Mass, and then all the students gathered together for praise, worship, and adoration. The gymnasium was turned into an adoration chapel for the day, where students could visit to spend time with our Lord in prayer. Near the end of the day, the friars led a procession through the gym, bringing our Eucharistic Lord within inches of each student. Calling to mind the story from the Bible of the woman who reached out and touched the cloak of Jesus and was healed, many of our students reached out and touched the vestments of the friar as he passed by with Jesus. The grace and mercy of the Holy Spirit overflowed through our gym as our students came face to face with our loving creator. 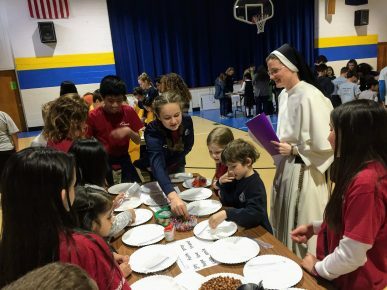 After encountering our Lord in the Eucharist and through reconciliation, our students learned that the natural reaction to receiving so much from our Lord should be to in turn share with others. Within their respective faith families, the students drew pictures and wrote Bible verses on bottles of water and canned goods. They were informed that families who were in great financial need would receive the food and water, and that many times these families benefit from receiving encouragement with the gift. After decorating the cans and bottles, they were given to our Outreach Office to be distributed to the poor in our community. The Faith Day this year proved to be rejuvenating and spiritually uplifting for the entire school. All four of our pillars, (prayer, study, community and service) converged into one day that brought our school closer to Jesus Christ and deeper in our understanding of what it means to be a community in pursuit of truth, beauty and goodness. Join Our Lady of Mount Carmel School in praying the Stations of the Cross with this interactive, prayer slideshow. Every Friday afternoon during Lent, our students walked over to our parish and prayed the Stations of the Cross together. Now you can join our students in prayer at any time! Please join us, especially on Good Friday, to pray the Stations of the Cross with us. Know that our students pray for you. Will you pray for us? Our Lady of Mount Carmel School will join the annual celebration week with Mass, an open house, an appreciation lunch, and great activities for our students, families, parishioners and community members. Through these events, we will focus on the value Catholic education provides to our youth and its contributions to our church, communities and nation. We’ve listed our plans here; please join us if you can! Friday Dominican Day Celebration Mass at 8:15 a.m. 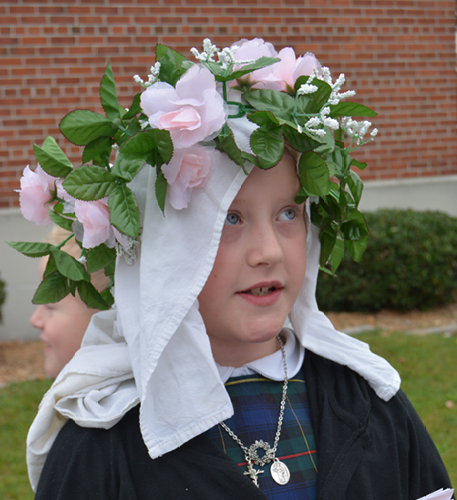 When November 1 dawns at OLMC School each year, our halls come alive with saints as our fourth-grade students dress in costumes representing their favorite holy heroes.